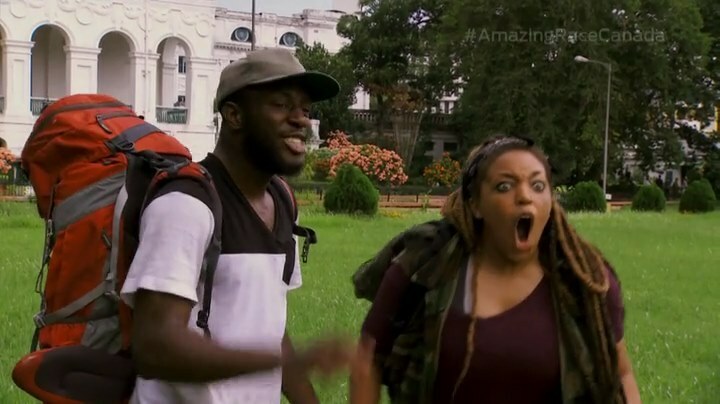 Recap: The Amazing Race Canada 3, Episode 8 – "I gotta get used to this bumping." Teams begin the 8th Leg by learning they will be flying to Kolkata, India! During the stopover in Vancouver, as a perk for winning the last Leg, Brent & Sean choose Dujean & Leilani to join them in getting upgraded to Air Canada International Business Class for the flight. The brothers say they chose Dujean & Leilani because of their encouragement at the equestrian Detour. After another stopover in Tokyo, teams arrive in Kolkata where they must make their way to the Mallick Ghat Flower Market. Here they will receive a blessing and the next clue. Brent & Sean are first and open the clue directing teams to exactly recreate a flower garland. As the other teams arrive at the market, Brent & Sean maintain their lead with the next clue. Teams must now walk to Armenian Ferry Ghat and hop on a ferry to Bagbazar Ghat to get the next clue. Brian & Cynthia are not comfortable in the crowded market. Dujean & Leilani fail their first attempt, but Simi & Ope get the thumbs up for theirs and leave in 2nd. Simi & Ope, Nick & Matt and Gino & Jesse manage to catch-up to Brent & Sean at the ferry. The next clue reveals the Road Block: Who wants to meet their idol? 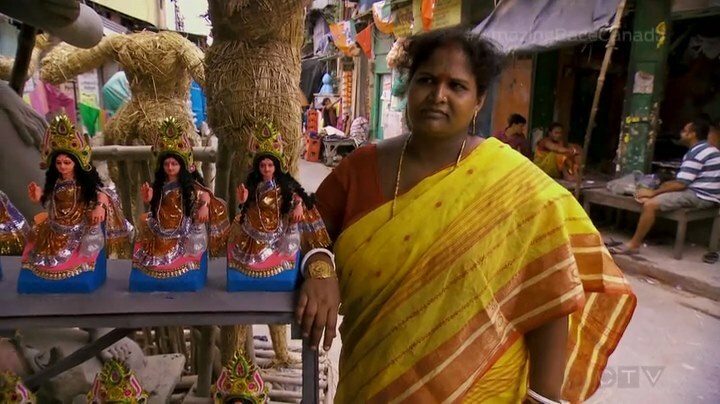 For this Road Block, teams must head to Kumartuli Pally and search for a specific stall with statues of the goddess Lakshmi. Using a photo in their clue, teams must find the one Lakshmi that matches it. Nick, Gino, Simi and Brent decide to do the Road Block. Gino & Jesse think Simi & Ope are vultures for following them to the location. They arrive there first and Gino quickly finds his statue. Teams must now head to Swami Vivekananda House and Cultural Centre. 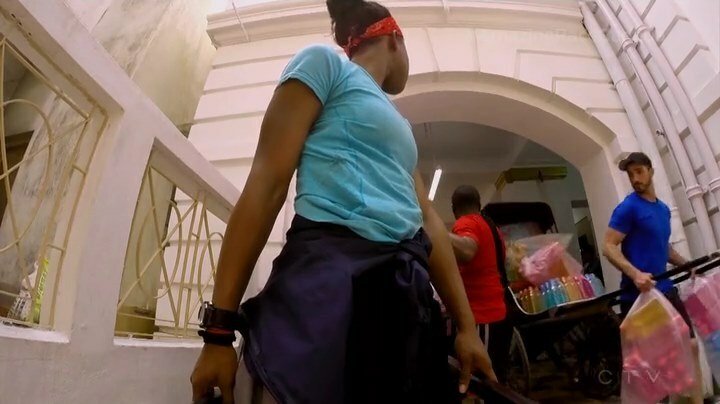 Simi & Ope are close behind and manage to find a taxi before them. They arrive at the monument to Swami Vivekananda and open the clue revealing the Detour: Tuck or Roll. In Tuck, teams must head to the Jorasanko Thakur Bari residence and learn a series of six couples yoga poses. Once they’ve correctly performed the poses for the guru Yogi Biswa, they’ll be given the next clue. 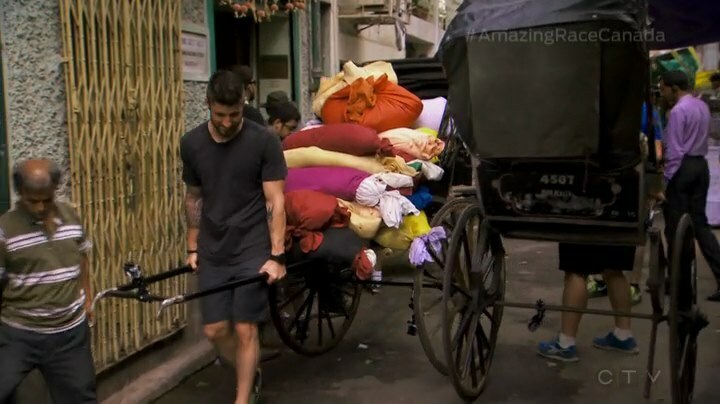 In Roll, teams will head to the University Institute Hall where they will load a pulled rickshaw and deliver plastic bottles to a soda shop and bundles of cloth to a decorating store. Simi & Ope decide on Roll. Back at the Road Block, Brian & Cynthia and Dujean & Leilani catch up to Brent & Sean. Leilani spots her idol very quick. Brian had no idea what’s going on at first, but finds his idol fast as well. Brent & Sean are last at the Road Block, but find a taxi before Brian & Cynthia. Simi & Ope, Nick & Matt and Gino & Jesse arrive at University Institute Hall. Nick & Matt saw their first location on the way here, so they know exactly where to go. Gino & Jesse decide to follow them like vultures. Brent & Sean zoom into 4th place with Dujean & Leilani and Brian & Cynthia’s taxi troubles. They choose Tuck as do Dujean & Leilani. Brian & Cynthia choose Roll. Dujean & Leilani have an easier time learning the poses than Brent & Sean. Gino & Jesse, meanwhile, quickly pass Nick & Matt in throwing the plastic bottles to the ground and move into the lead. But on the second delivery, Nick & Matt find the location first. Simi & Ope make their first delivery as Brian & Cynthia arrive to start. At the other side of the Detour, Dujean & Leilani successfully perform the poses and get the next clue pointing them to the Pit Stop at the National Library. Nick & Matt finish the Detour as well and it’s a Race to be 1st. Brent & Sean are struggling with the last pose. And the frustration grows when Brent hurls himself over Sean and hits the ground. They feel like this is their lowest low they’ve had on the Race. Gino & Jesse get snippy with each other as they finish the Detour while Simi & Ope cross a busy road and get a guy to move their truck to finish. 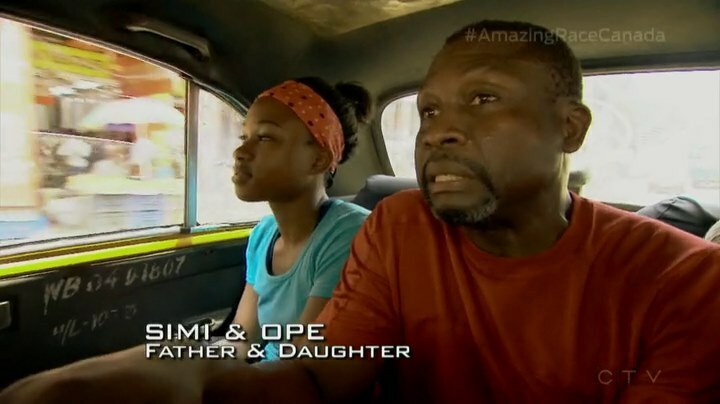 Simi & Ope manage to find a taxi before Gino & Jesse. As Brian & Cynthia make their first delivery, Brent & Sean go for their first attempt. Which they pass. They hop into a taxi to the Pit Stop. Nick & Matt are shown as being in 1st place with Dujean & Leilani in 2nd when they spot them on the way. Nick & Matt’s taxi take a different turn. That mistake allows Dujean & Leilani to step on the Mat in 1st to win the Leg. They win a trip to London and free gas for the next year. That means Nick & Matt have to settle for 2nd. Brian & Cynthia finish the Detour, but have trouble finding a taxi again. Cynthia has a nice local helping them flag down a taxi, but Brian wants to go up the road. Update on the placements. Brent & Sean are now in 3rd with Simi & Ope in 4th on the way to the Pit Stop. They spot each other. It’s a footrace to the Mat with Brent & Sean officially Team #3 and Simi & Ope as Team #4. Shown as “Currently tied for last place,” Gino & Jesse and Brian & Cynthia’s fates are up to taxis. Arriving in 5th on the Mat are Gino & Jesse. That means Brian & Cynthia are last. And eliminated! But it wasn’t! This would’ve also been a great place for a TBC Leg (better than Magdalen Islands even though I love Simi & Ope and Neil & Kristin). The episodes and Legs this season have been interesting. They all have been slowburns in that they start off really slow and almost boring. Then the 2nd half perks up and they always end with a bang. Maybe it’s the format of the Legs which have been: Active Route Info > Detour/Road Block > Road Block/Detour. Maybe they could shift the extra tasks to the middle or even the end of the Leg instead of always having them right at the start. The early tasks also always seem to be the simpler ones or less drama-filled ones. It could also just be the editing. But whatever it is, it has a great effect. 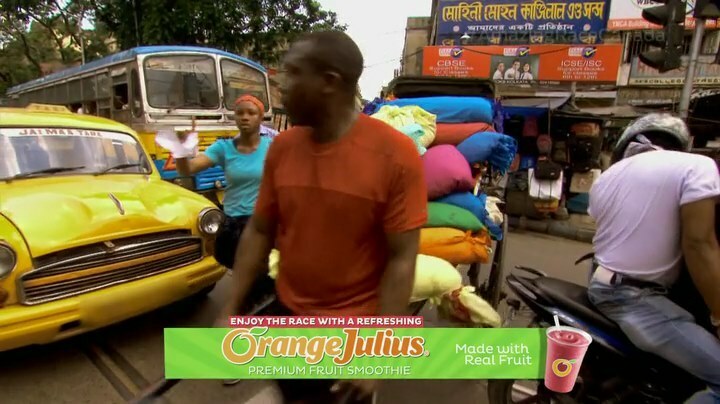 The flower market task is definitely a Kolkata Leg task. (Hello TARPHDME2! lol) The Road Block was just okay, especially only being held in just a little stall. But the rickshaw Detour definitely brought out the best of India. That Detour shows just why India is one of the very best countries for TAR to visit. Delivery tasks in crowded, congested areas are TAR staples. And we saw why here. The yoga side of the Detour is probably one of the tasks I would love to force (*evillaugh*) all teams to do. That was great. The race to the Pit Stop was very exciting. Seeing almost all teams on the way to the Pit Stop at the same time when teams had been far apart for the first half of the Leg was great. 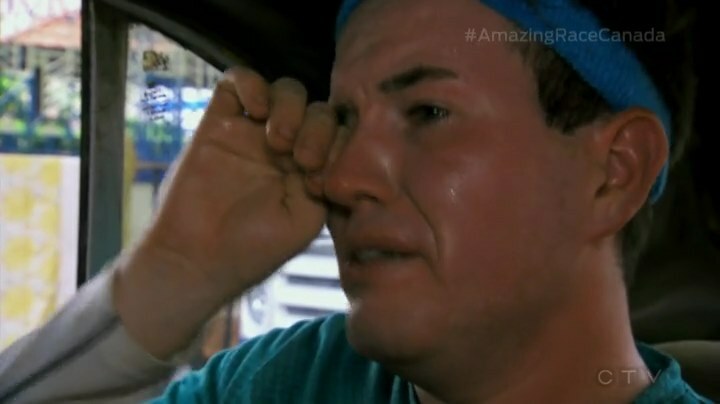 This episode and Leg is probably the best contrast to The Amazing Race Philippines 2 and many of the recent American TARs. We saw teams actually competing with each other. They were Racing against each other. Placements changed, decisions had to be made, luck was involved. Teams need to be able to compete side-by-side. TARPH and TARUS have forcibly separated teams with faux sign-ups or staggered departures. Have them Race and let the sparks fly! Let me just start by saying I don’t dislike any of the teams. I wouldn’t be too upset with any of them winning at this point, but of course, I am rooting for some more than others. Brian & Cynthia were just awesome this whole Race. They Raced well, provided lots of laughs and even lots of drama. But mostly fun. Brian may not have been “impressed” many times, but I was certainly impressed by what they brought to the Race. I think they’re like a next generation Teri & Ian. Maybe a little Teri & Ian-lite, but also with their own flavor. It’s very sad to see them go. I was definitely rooting for them to make it to the Final Leg. Simi & Ope continue their steady Race. They’ve been in trouble before, but they have done well to stay calm. On the other hand, it should be great to see them really step it up especially now in the Final 5. It won’t be easy, but I think they have what it takes. Brent & Sean have provided a lot of great laughs. They started off okay this Race, but have since really delivered with each Leg. They’ve become great Racers and of course have given us some unexpectedly hilarious moments. Since Brent was okay after falling on his head, we can laugh at what an incredible moment that was. Hehe. Dujean & Leilani have had a seesaw of a Race I think. When they’re good, they’re really good. But when they falter or get into bickering couple-mode, they’ve really stumbled bad. This was one of those Legs that really showed how well they can Race. They stay focused and calm and choose tasks they really feel they can do. That has definitely paid off for them and could do well for them getting to the Final Leg. I definitely had to sideeye Gino & Jesse for following Nick & Matt after calling Simi & Ope “vultures” for doing the same to them. But they at least have been entertaining as well. I wish we got to see more of that little brotherly bickering though like we did here. That’s always fun. At least, more fun than them dominating the Race like what was appearing to happen a few weeks ago. 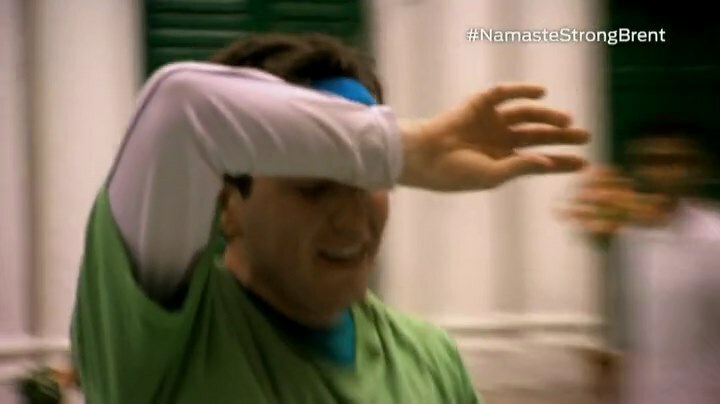 Nick & Matt‘s struggle to win a Leg could easily be foreshadowing to them winning the whole Race. But that they always come close is a good thing really. They’ve been Racing well and consistently, so barring huge bad luck, they should have no problem securing a spot in the Final Leg.